* 1985 was the Chinese Zodiac year of Ox. 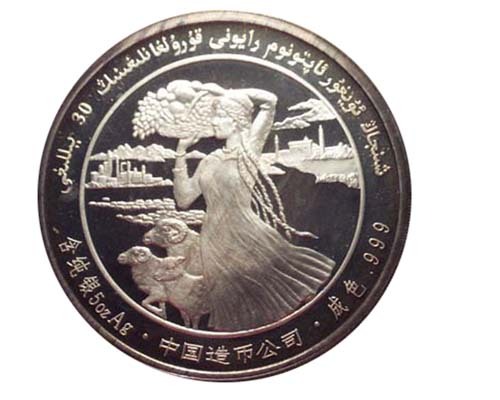 Its commemorative coin of Ox was officially issued in January of 1985. On the obverse of the gold coin, there engraved the People’s Republic of China in characters for the first time on a commemorative coin, and the year of circulation. Its architecture design is the Marble Boat, the amazing ancient China’s architecture on the water in Summer Palace of Beijing, which is located on the Kunming Lake, west side of the Longevity Hill. First built in 1755, Emperor Qian Long hoped the Marble Boat symbolized the stability of Qing Dynasty: water can not overturn a boat. Originally the Marble Boat had oriental style cabins. In 1860, it was burned by the British and French forces, which only left the main body of the boat unburned. It was then restored in 1893, imitating the French yacht when building the cabins. It also added stone wheels and was named as “Qingyanfang”. The body of Marble Boat was built by laying huge stones, 36 meters long, both cabins of the two stories are made of wood structure, which were painted with marble designs. With vibrant colored windows, stone carved ceiling, the whole Boat has exquisite designs. It is a main viewing place for tourists when visiting Summer Palace.